RENFREWSHIRE’S depute provost John Caldwell yesterday admitted he was no athlete. 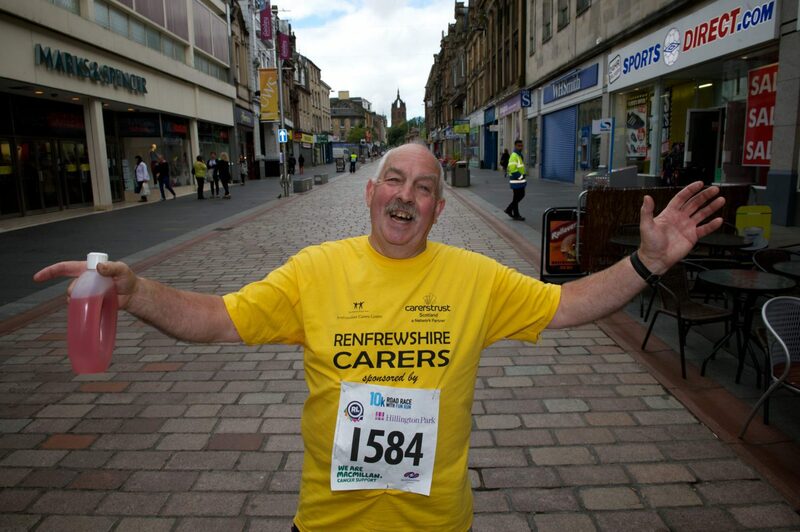 But the 66-year-old still put himself through the physical exertions of completing the Paisley 10k Race as he’d promised to raise money for the Renfrewshire Carers Centre. Depute Provost Caldwell walked the course in two hours and he made history by being the first civic leader ever to take part in the race. He was part of the Renfrewshire Carers Centre team taking part in the Paisley 10k hoping to raise hundreds of pounds in sponsorship. “I’ll never be Mo Farah, but what is important is taking part and raising money and awareness for a very good cause. “I might not have won the race but the Carer’s Centre is certainly one of the many winners here today as many charities and good causes will be tens of thousands of pounds better off. More than 1700 people took part in the 10k Race. The men’s winner was Callum Hawkins (Kilbarchan AAC), with a time of 29 minutes 24 seconds. Second place in the men’s race went to Kamil Sieracki (Shettleston Harriers) with 30.42 and third was Tewolde Mengisteab (Shettleston Harriers) with 30.48. The ladies winner was Gemma Rankin (Kilbarchan AAC), with a time of 35.36; second was Lesley Chisholm (Garscube Harriers), with 36.34 and third was Jessica Oliver-Bell (Shettleston Harriers) with a time of 36.50. The shorter 3k Fun Run, which began after the Paisley 10k finished, attracted almost 700 runners. They came in all shapes and sizes, ages and levels of fitness – some even ran in fancy dress. But they ran to raise much-needed funds for charities and good causes. “ Once again we had a fantastic turnout for the Paisley 10k Race and Fun Run. “We really have to pay tribute to the runners who participated and the huge amount of money they will have raised for charities and good causes. “It’s not just that they deserve praise turning up on the day to take part in the event, it’s the months of preparation and training that goes into running the race. Joyce added that Renfrewshire Leisure aims to make the Paisley 10k and Fun Run an even bigger event in the next few years. She said: “We’ll be taking it to the next stage as a major community event for Paisley’s bid to be named City of Culture 2021. Sport in general and Renfrewshire Leisure in particular has a part to play in winning this accolade for the town.